This event has been Canceled due to Impending weather. Please mark your calendars for our May movie night! Join us on the Field at the Pensacola Greyhound Track, 951 Dog Track Road, for a Family-Fun, FREE Movie Night! 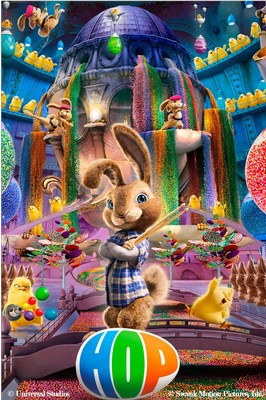 For April's Flicks on the Field, We will be showing the Movie, HOP! 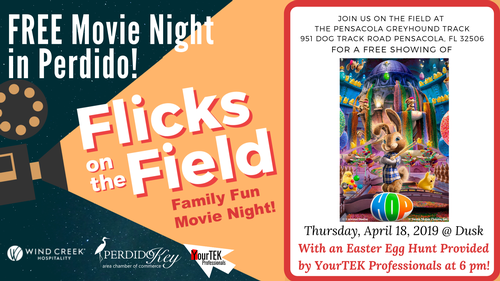 This unique Flicks on the Field Event will include an Easter Egg Hunt provided by YourTEK Professionals before the movie at 6 pm! Bring your lawn chairs and blankets for a movie night under the stars or enjoy the movie through your radio from the comfort of your car! Concessions will be available. Arrive early to claim your spot! The Movie will start at Dusk. Inclement weather will cause the event to be moved to the following Tuesday and possibly indoors.